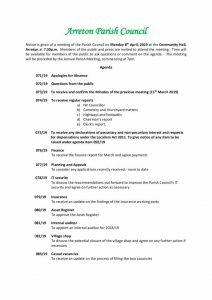 Arreton Parish Council normally meet on the second Monday in a month at 7pm in the Community Hall. There is no meeting in August. 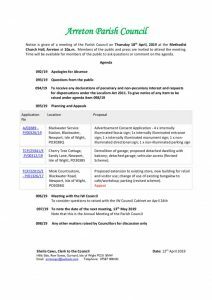 A meeting of Arreton Parish Council was held on Monday, April 8th, 2019 at 7.30pm in the Community Hall, Arreton. It was preceded by the Annual Parish Meeting at 7pm. 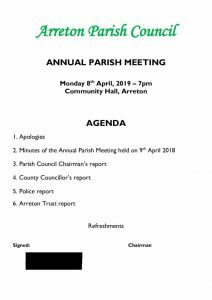 An extra meeting of Arreton Parish Council will be held on Thursday, April 18th at 10am in the Methodist Church Hall, Arreton.